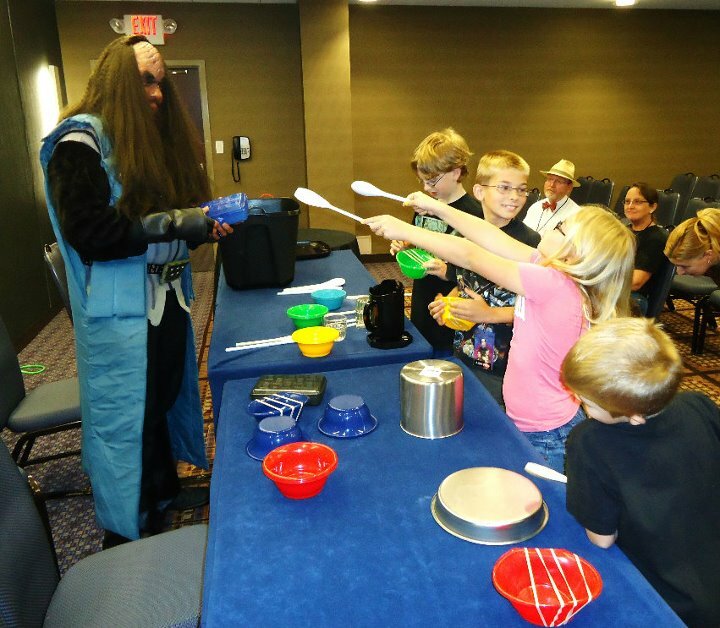 Jon Silpayamanant teaching an “Alien Music workshop for Kids” at Cyphan Science-Fiction Convention in Chicago, Illinois. The issue at hand is precisely how to get work as a musician (if you don’t, as I said earlier, already hold a position as a full time musician in some institution). The issue at hand isn’t how to get work as a classical musician, or how to get work as a rock musician, or how to get work as a bluegrass musician. It’s how to get work as a musician. Period. And that requires thinking outside the box of the style of music you happen to be comfortable doing! For example, I’m very much not comfortable doing pop music in general and yet, in the past decade I’ve probably performed about a thousand shows at rock clubs with rock musicians, playing all manner of rock/pop music on bills with hundreds of other rock/pop musicians. And Klingon music? Well, that’s really not that different-the way I look at it (and any other style of music) is just that it’s, well, music–just happens to be music in a different style and in a different language than what I normally do. Not that I normally do music in any style or any language, per se. I just do music. As a result of having this openess, I’ve picked up several different skill sets that you wouldn’t normally associated with, well, any particular musician. I mean really–what kind of category of musician would include a description that says “must be able to sing in Klingon and a few dozen terrestrial as well as extra-terrestrial languages, while playing the cello. AND must be willing to play several instruments, sometimes including the main instrument. AND must be relatively proficient and fluent in dozens of musical styles from all over the world, including highly experimental styles and genres”–? 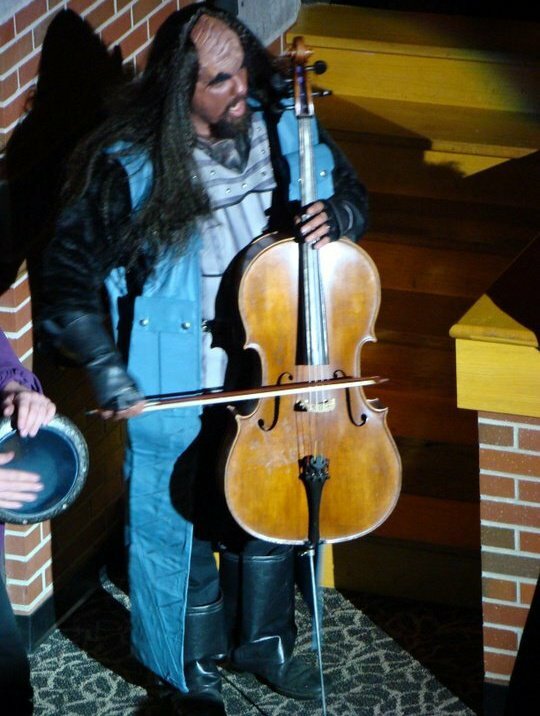 Jon Silpayamanant performing with the il Troubadore Klingon Music Project at the Indianapolis Children’s Museum during their “Incredible Costumes of Film & TV” exhibition in Indianapolis, Indiana. There were well over 8000 people at the event. 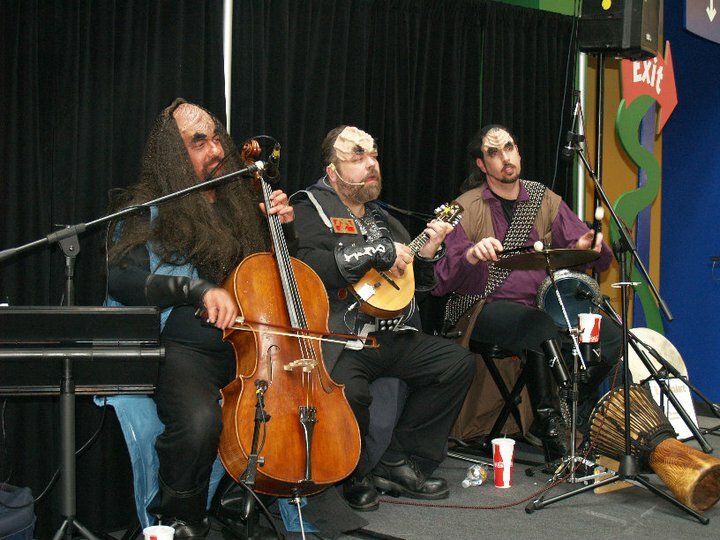 Recently, the il Troubadore Klingon Music Project had the opportunity to play a Klingon Wedding. In some ways, this was no different than all the non-Western Weddings, Holiday events, Engagement parties and whatever, that we’ve played. Next April we might have an opportunity to play another Klingon Wedding. But as is the case it’s a choice between two different Sci-Fi conventions, and with me, I also have the opportunity to play some wonderful Symphonic repertoire with the local IUS Orchestra. This is the position I’ve been in for years now–having to choose between various gigs in musical genres/styles that have next to nothing to do with each other. I believe it’s still the case that I turn down as many, if not more, gigs than I accept. Granted, many of those gigs are weekend gigs–which is prime time for shows. But as I’ve taken on a much heavier teaching load the past couple of years, many of the opportunities I have to turn down are due to my teaching responsibilities. I’m still on the fence about that issue. On the other hand, if I were just a classical cellist looking for work, I would be in a much worse position than I happen to be in now. The ultimate trick is finding ways to perform during “non-prime” times. And that’s where the educational component comes in–in-school programming is prime-time for, again, those musicians that think outside the box. I’ve done a few such programs over the past few years, but classically trained musicians often have a bit of an edge in this direction since there is almost invariably an outreach component to their activities. As I slowly work up solo material, I’ll eventually start getting my foot more into the door for these kinds of shows. It’s an area where many musicians make a full time living and in many ways, this is the direction I prefer–performance/education. It’s what I do naturally with the groups and performances I already do, so it’s really hardly a stretch for me, anyway. 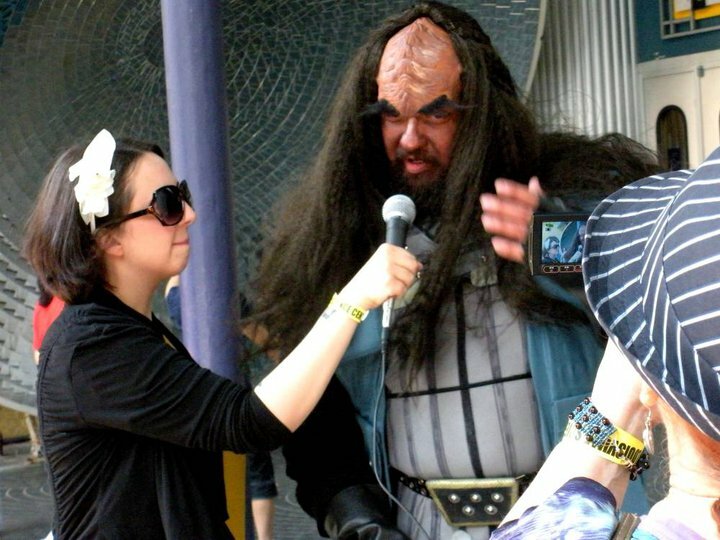 Jon Silpayamanant being interviewed in between singing Klingon Opera by Audrey Brown of ‘Born For Geekdom’ blog outside the Louisville Science Center during their “Star Trek: The Exhibition” exhibit in Louisville, Kentucky. So, in some ways, it is ridiculously easy to make a living doing music in this day and age. The opportunities are endless and only limited by the imagination. But in some very important ways, it is the most difficult time to make a living doing music, since our entrenched ideas about what it means to be a musician can get in the way more than a depressed economic climate or the taste of a fickle public. We can’t control the world, but we can control our own perceptions of ourselves and of the world. Joel Conner’s Blog, “Living the Dream: Artistic Living,” charting his bid into making a career out of playing music: http://joelandrobert.wordpress.com/category/artistic-living/. His latest blog post is incredibly inspirational. Hmm, LO first played “Star Wars” charts on pops concerts a few months after the first SW movie appeared – fall 1977. Those were better charts, single pieces extracted straight from the film score, than any of the successively watered-down published arrangements that followed. And as far as full-themed SW concerts, there were some competing versions of those, with laser light shows, etc., all touring in spring ’78. In fact, in Louisville, a touring one with the “Chicago Philharmonic” (so close!) scheduled over the top of the LO’s scheduled one so that neither sold enough tickets and both shows were cancelled. LO did the full-blown “Lord of the Rings” concert back in spring 2007. Quite successful, ticket sale-wise. Crowd was up for it – we even had a Gandolf in the Grand Tier. And you left out the “Video Games Live” concerts – we did two sellout concerts here, and they have been popular elsewhere, also. Right, Raymond–the video game music concerts seemed to have done quite well where they have played as well. I think the issue at hand is that the pop culture is creeping up (for good or ill) more now than it ever had in the past. That’s interesting to know that Star Wars has been around that long (as a concert type show). I only meant to mention this particular popular sub-culture (the Sci-Fi/Fantasy) as there have obviously been a number of other ‘crossover’ events (te.g. he Beatles Music; Cirque de Orchestra; etc)–but that is VERY interesting with the competing variants of the Star Wars shows. If you’ve been following this blog for a while I think you might have noticed that I’m not entirely sold on (what Drew McManus) is calling the Chicken Little Think Tank regarding the doom and gloom of orchestras–and with that the (often) touted idea that this “American genre of Symphonic music” in popular culture is one of the saviours of the Classical Music (in the states). It might work in the short run, or for selling out a few concerts, but what would happen if every concert was like this? I think part of the reason these things do so well is the relative scarcity of the programming relative to standard concert seasons. I think far too much has been made of the ‘popular music’ model of ‘success’ as a model for Orchestras especially if we consider how well popular music is really doing (which is no where near as well as most folks would think)! In my post above, I am not trying to dispute your point, which is an excellent one. I heard Dave Taylor, a free-lance bass trombonist out of NYC, make the very same post at a master class at a trombone workshop back in the late 80s, when he surveyed the college trombonists in the room, then asked how they were all going to fit in the one or two orchestra jobs that open each year (and are rapidly closing now, it would seem). Dave had made a career of his own by finding and commissioning new solos and works for small groups and them playing in small venues, not unlike what you are doing – albeit with less makeup. Hah! Thanks for the clarification, Raymond. That’s an excellent point that Dave Taylor makes–and many are still making to this day. Yet we still crank out musicians through the conservatory system at (possibly) an increasing rate. It shouldn’t be such a surprise that so many in the larger cities are forming their own ensembles or joining non-traditional ones. Which isn’t necessarily a bad thing–gotta follow the dream, after all. But that is the fundamental issue for, especially, the music educators–those of us who understand where the majority of these young musicians may (or may not) end up question the whole idea of training new musicians. Or at least that is something that is constantly on the back of my mind! Mainly I just wanted to emphasize that I’m fully behind musicians when it comes to the disputes between management and talent [sic] in Orchestral organizations. Not that I don’t understand how the infrastructure of the organization as a whole on both sides can easily lead to impasses, of course. NYC (and other large metro areas) is (are) one (some) of the ideal places to carve out a niche for oneself as a musician. I’ve only been able to do what I do by virtue of having a number of groups and networks I work with from Indianapolis down to Louisville (and between). Granted, some of that is as much due to the connections I’ve made over the years as it has to do with (perhaps) my inability to diversify enough within the Louisville Metro area. I’m working on the latter, however, and I am still new to the area (or, rather, new-ish, as I grew up here and then moved back a few years ago). Can you link to any particular Drew McManus with that argument? I don’t remember the particulars of that. Not that the ideas presented are necessarily bad ones, but I think they, well, protest too much. Especially as Sports (along with the Pop Music Industry) are held up as standards to model for creating successful organizations. When a third of NBA teams (or other sports orgs) routinely lose money (even if the industry as a whole makes money) we don’t seem to have sports pundits talking about changing how NBA teams are modeled.